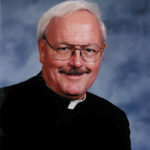 he attended while growing up on the city’s near west side. 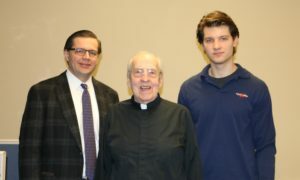 However, in his more than 65 years as a Viatorian, he has more than paid back the early impact his teachers and parish priests had on his life. Fr. 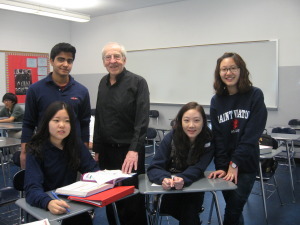 Perham is an award-winning mathematician and nearly all of his years in ministry have been spent teaching math, including the last 50 years at Saint Viator High School. While he formally retired in 2002, he continues to work at the school every day, tutoring students in the math lab and working with members of the math team, preparing them for state level competition. In fact, each of the last two years the students he has worked with in the difficult “oral competition” have advanced to state. When he’s not working with mathletes, Fr. Perham is designing problems of his own for members of Saint Viator’s Querbes Scholars program. He meets with students during their homeroom period to go over the problems, which are designed to weave in technology with the students’ understanding of mathematical concepts.